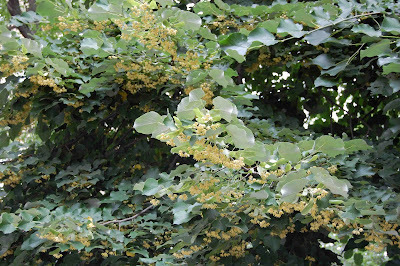 A branch of linden covered with fragrant flowers. Click to enlarge. New York City smells fabulous this week. It's one of those times I pass up urban wildlife to write about a plant -- the lovely linden. Linden trees are blossoming right now. They are covered with little yellow-white flowers like tiny bells, each releasing perfume that smells like limes and honey. It smells so good that it stops me in my tracks. 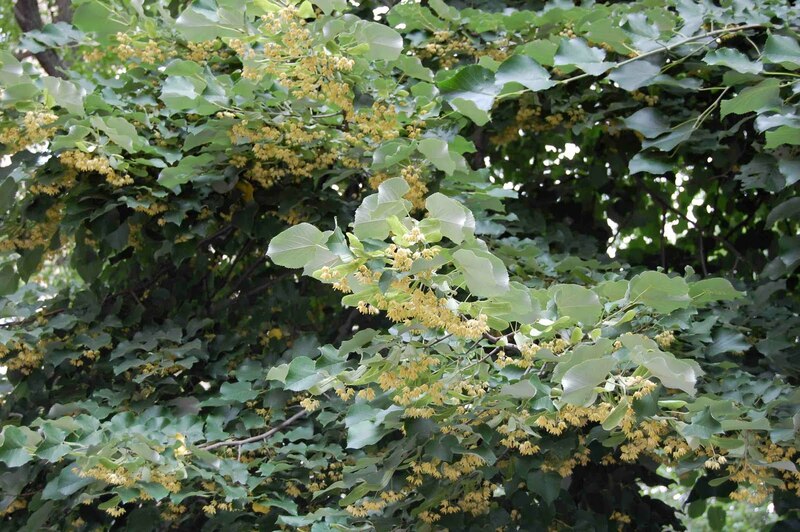 I've been standing under linden trees all week long, just inhaling the aroma. Mmmmmm. 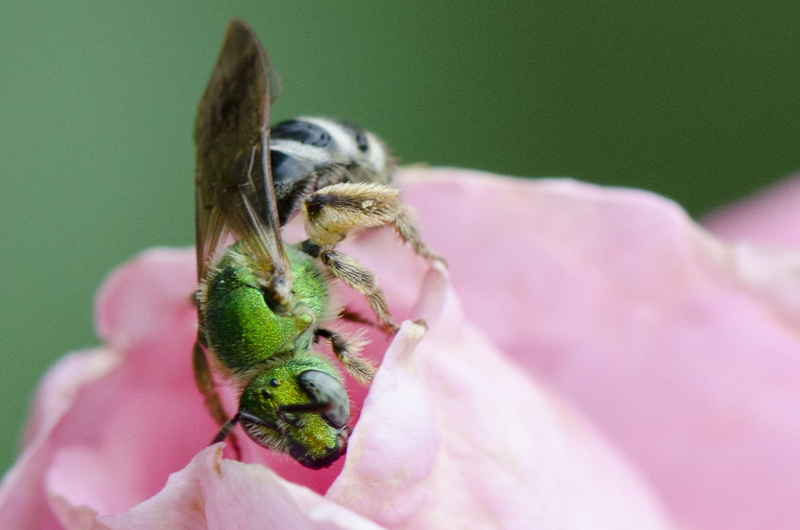 Lindens are sometimes called bee trees because they are so attractive to bees (not just to me). The linden's honey is unique: it's woody and fresh and delicious. It is believed to help aid sleep and many people take it before bed. Combine that with a bath with dried linden blossoms and you are set for the night. 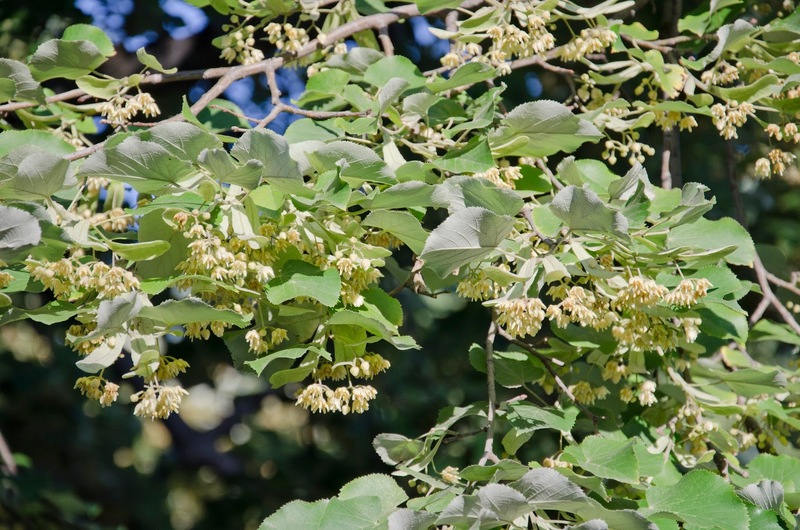 There are about 30 kinds of linden trees that grow across the northern hemisphere in Asia, Europe, and North America. Everywhere lindens grow they have been woven into the cultural mythology. 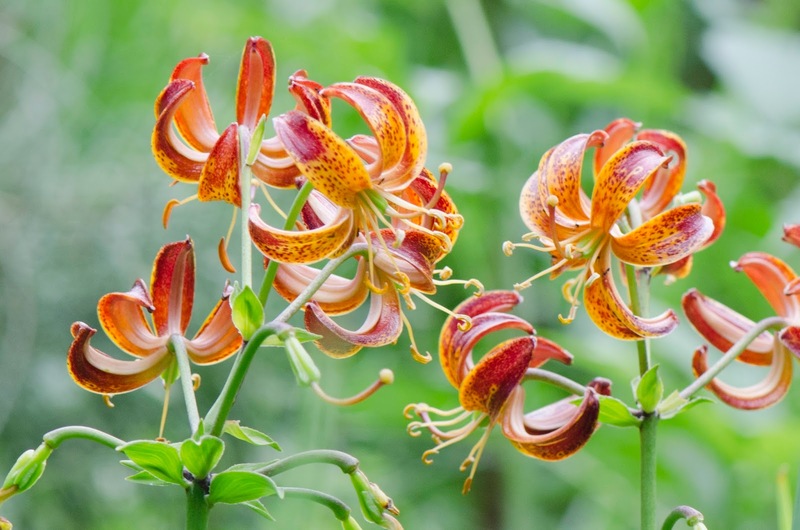 The flowers are used medicinally and even the ancient Greeks praised them. The tree was associated with the Germanic goddess of truth and love, Freya. Some people still think one cannot tell a lie while standing in the shade of a linden. Lovers used to meet below them to swear faithfulness. I hear that a modern Wiccan might make a staff out of linden because of its powers of attraction and creation. All that and it smells fabulous. Here is a poem by D. H. Lawrence that seems to fit a week that has been dominated by thunder storms and linden trees. The lime-tree he mentions is another name for linden. The last word is the place in Germany where the poem was written. how still the trees are! hardly looses even a last breath of perfume. with all her grace of foam! Last week I led a nature walk in Central Park for the American Museum of Natural History's Membership Department. Even though I got rained on twice, there was a lot to see. 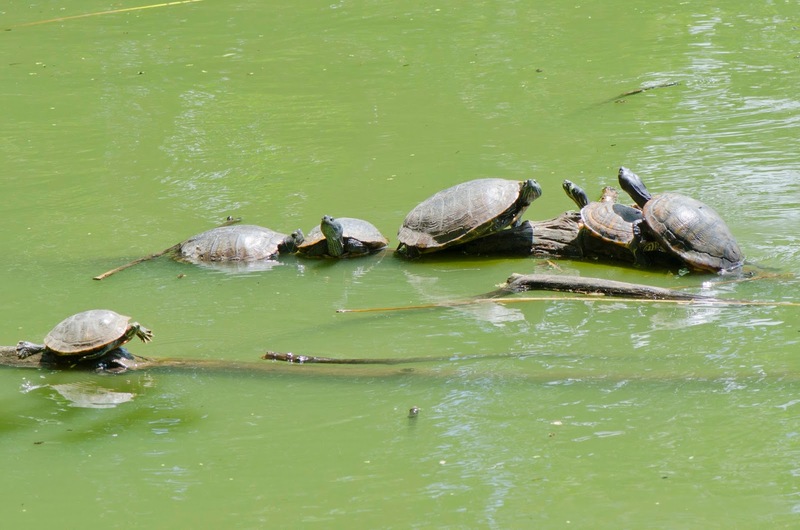 Here are some of the wild creatures that were in the park on Wednesday. Turtles were basking in The Lake. 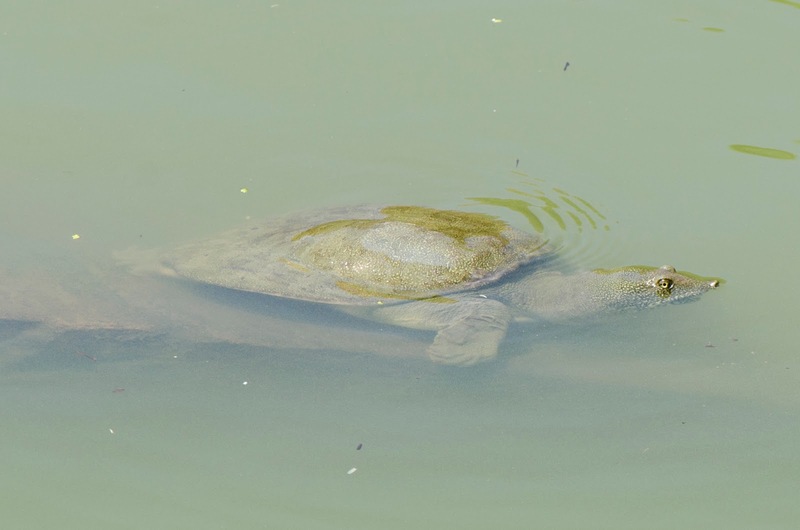 Red-eared sliders are the most commonly seen. Click to enlarge. Scanning the waters there often turns up a Chinese softshell turtle like this one. 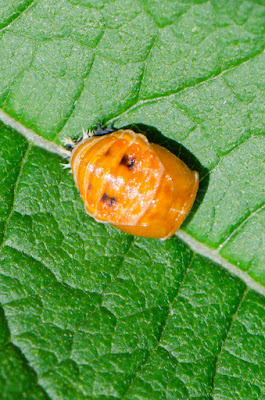 This ladybug pupa was in the bushes near the Ladies Pavilion. 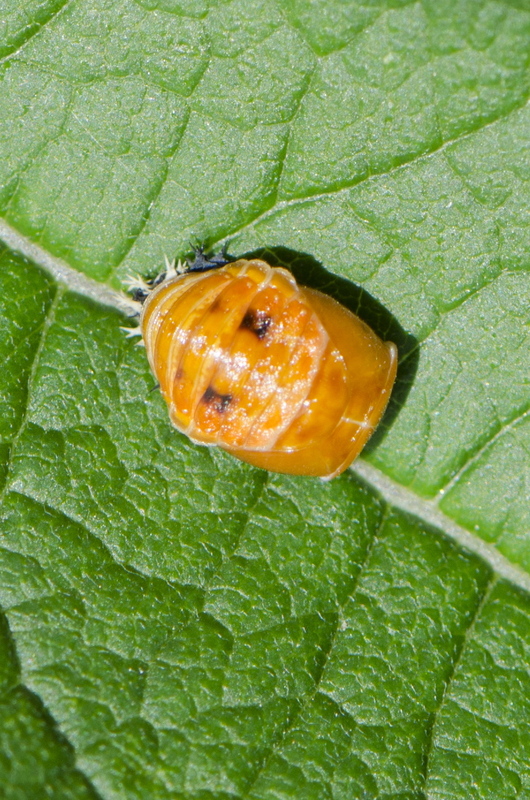 An adult Asian multi-colored ladybug will emerge. 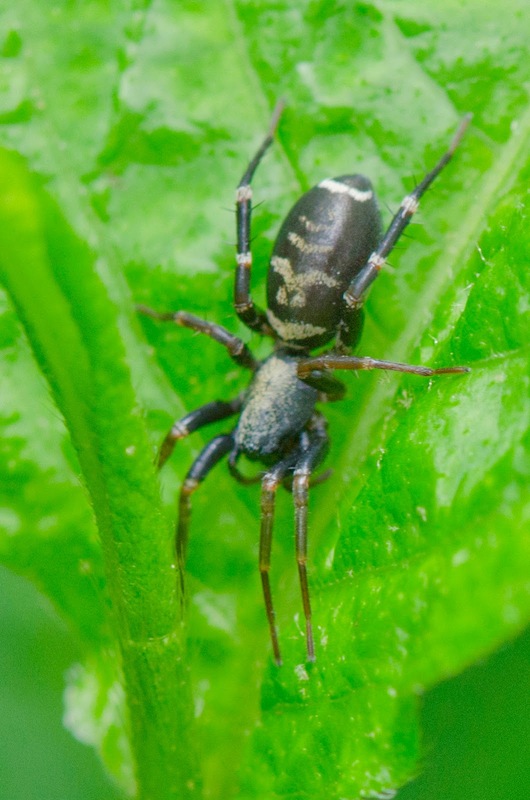 The light-colored spines at the upper left are diagnostic for the species; I hear they are the remnants of the spiky skin of the last larval stage. 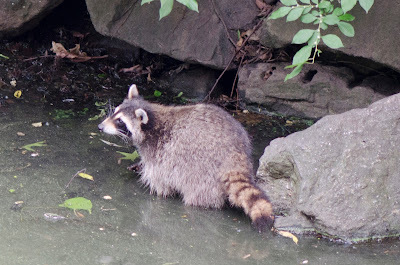 This raccoon was hanging around the Oak Bridge. 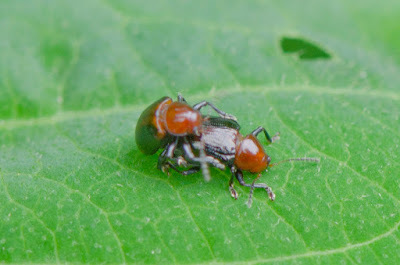 A pair of Paria beetles was mating on a leaf. 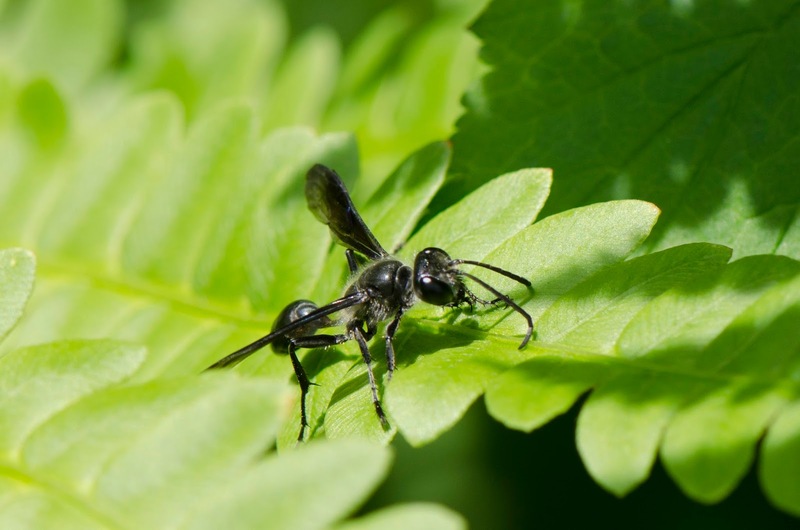 This Isodontia wasp glittered in the fleeting sunshine. 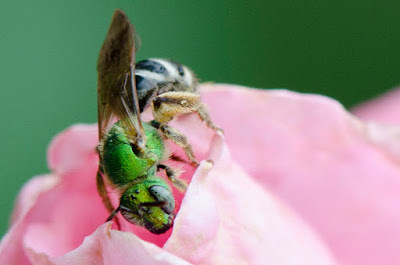 A green Agapostemon bee posed on a pink rose. And the Shakespeare Garden was full of blossoms. You never know what you will find when you take a walk in the park, but... John Muir once said: "In every walk with nature one receives far more than he seeks." I found a family of rare ladybugs in my neighborhood this week. Rare now, but once common. Here's one of them: the two spotted ladybug, Adalia bipunctata. Click to enlarge. The two spot is one of three species that the Lost Ladybug Project is hoping to hear about from ladybug spotters like me -- and you. 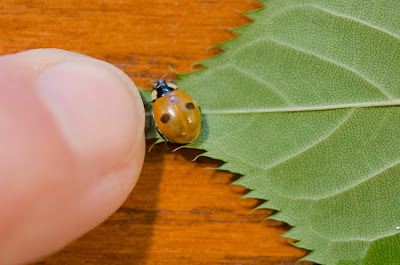 Click here to go to the Lost Ladybug Project's website to read all about it. 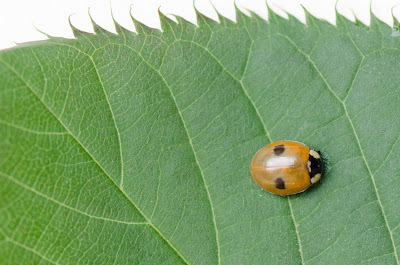 Basically, the ranges of some native ladybugs are shrinking and the group is trying to find out why. They encourage everyone to take pictures of local ladybugs (all of them, not just rare ones) and upload the pictures to their website for analysis. It's not a very good photo, but it is good enough to tell what it is. 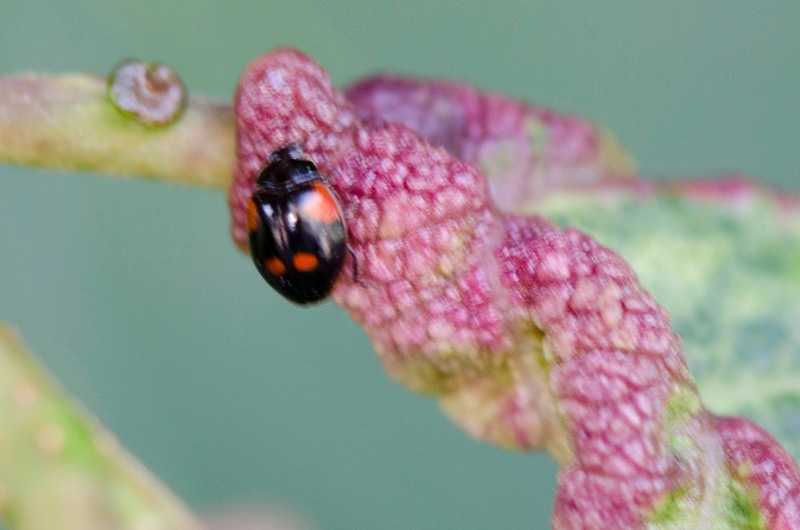 I sent it to the Lost Ladybug Project. They confirmed its identity and congratulated me. I'm proud. 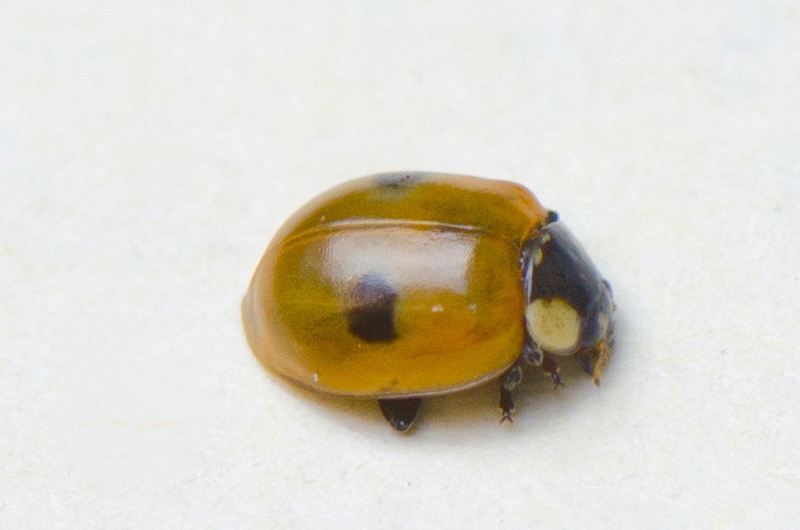 It's a brand new two spotted ladybug, of the more common color scheme of orange with black spots. There is a family of two spots living on a cherry tree in Brooklyn Heights. Yay! This one is in my garden now. I saw this milk snake, Lampropeltis triangulum, being moved from a dangerous parking lot into the woods at Great Swamp National Wildlife Refuge in northern New Jersey last year around this time. Click on the refuge name to read more about the place; it's a great spot for wildlife viewing. Click on the photo to enlarge. I'm under the weather today, so instead of writing a blog about this snake, I'm inviting you to read D. H. Lawrence's poem: Snake. Click here to go to the poem.